"I'm a big fan of finding reasons to get up once in a while and walk around a bit," says Blake Menezes. He works as a social media strategist at the US software firm Autodesk and is taking part in a company-led health challenge. Staff teams equipped with pedometers are competing to see who can achieve the most steps over 100 days. 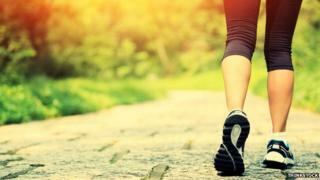 "Having that pedometer does illustrate quite clearly how active you are… and it makes you walk," Blake says. And the benefits are immediate, says colleague Clay Helm, the firm's PR director: "I'm a lot more productive and less stressed. Sometimes your best ideas happen when you're away from technology." They both enjoy the competitive nature of the scheme as it provides an added incentive to exercise. "I'm an average person, not an athlete," says Clay, "but I don't want to let my team down… the team expects you to contribute and come up with results." Autodesk is one of a growing number of companies spending on wearable technology to encourage its staff to lead a more active lifestyle. It provides staff with a pedometer as part of its corporate wellness programme, taking the view that having healthier, more active workers is good for productivity. Oil giant BP's North American business offers its staff Fitbit fitness trackers - wearable bands or clip-on devices that monitor your steps, calorie intake and sleep patterns. And it's proving popular - BP distributed 24,500 of them to staff and dependent spouses in 2015 alone. No doubt the scheme's popularity is partly due to the fact that activity points earn staff discounts on their health insurance premiums. Participants of the voluntary scheme aim to reach one, two or three million steps in a year. And BP believes its staff are fitter as a result. The company tells the BBC that 81% reached the million step goal, "providing evidence that participants engage in physical activity year-round". In 2013, about 2,000 companies offered their employees fitness trackers, according to technology research company Gartner. In 2014, this rose to around 10,000. By 2016, the firm predicts that most large companies - those with more than 500 employees - in both the US and Western Europe will offer fitness trackers with their programmes. These are unlikely to be Apple smartwatches, however, as they are significantly more expensive than wearable devices from the likes of Jawbone, Fitbit, Garmin, Microsoft, Basis and others. "A lot of companies view [these schemes] as giving them a competitive advantage," says Ryan Martin, wearable technology analyst at 451 Research. "They can improve overall employee wellness through data collection. They're not just making workplaces better, but decreasing unplanned leaves of absence." So far, this trend is being led by the US - partly because its healthcare system is built around health insurance - a perk often provided by employers to their staff. The UK's publicly funded National Health Service means insurance and employee health are less intricately bound. But think of the people you know who measure their steps, calories and sleep. Aren't they the ones who already go to the gym, eat healthily and generally lead an active life? This is a problem that all these corporate fitness and wellness programmes come across. They want to reach the more sedentary part of the population - not just "the worried well". Companies argue that the workplace is a good way to do this - with the less active types more likely to take part if their colleagues are already doing it. Fitbit, which recently listed on the New York Stock Exchange, says various studies show about 20% engagement in general wellness programmes. It claims this figure rises to between 40% and more than 80% with a Fitbit programme. The firm recommends that chief executives take up the challenge - leading by example - and suggests buying the "tallest, cheesiest trophy" to reward weekly winners. Mr Ryan of 451 Research says that Fitbit rival Jawbone in particular wants to take a more holistic approach to fitness. That is, it doesn't just want to measure activity, but prompt it, too - suggesting you get up from your desk and stretch your legs if the wearable gadget detects a long period of inactivity. But what about the privacy issues surrounding sharing health data with your employer? Autodesk's Clay and Blake say they don't mind, emphasising the voluntary nature of the scheme. And both BP and Autodesk say they only have access to aggregated data - not to any individual's particular details. Gartner's Annette Zimmermann believes the workplace fitness tracking trend "is coming to Europe and the UK" but that "there will be different business models for each particular country." "Our research shows that even if initially people are tentative about sharing [health data], they are willing to do so if they get something in return." Image caption Will companies be tempted to make wearing fitness trackers compulsory? In other words, everyone has their price. But US campaign group World Privacy Forum has specifically named wellness programmes as a problematic area. It is concerned about companies potentially selling on data to marketing firms with the result that individuals could receive targeted advertising. The group recently asked the US Equal Employment Opportunity Commission to look at the issue. The lobby group also wants a limit to the size of discounts offered on employee medical benefits, arguing that if the discount is too steep, poorer workers may feel compelled to take part - even though they may have valid reasons for not wanting to, such as pregnancy or religious objections. Despite these concerns, workplace fitness tracker schemes look set to become more widespread, particularly if evidence grows that they help increase productivity and reduce sickness absence. But ensuring they remain voluntary should keep privacy campaigners busy for years to come.